Even though state taxation has moved away from the worldwide unitary method, with Alaska being the only state currently requiring use of the worldwide unitary method and only then regarding oil and gas corporations, there are still many situations where non-U.S. companies should be attuned to state (and even local) tax issues. What is a state’s ability to tax a non-U.S. company? Answer: Each state has its own law as to when a company, U.S. or foreign, is subject to tax, so the law of each state in which a company is doing business must be consulted, and the results will vary among states. However, as a broad proposition, the Commerce Clause of the United States Constitution, as it applies to both U.S. and foreign companies, requires “substantial nexus” in order for a state to impose a filing obligation and a tax. Having a physical presence in a state, e.g., property or employees, will almost always give rise to nexus to tax. More recently, the trend among states is to tax based upon so-called economic nexus, i.e., nexus in the absence of a physical presence in a state. For example, an economic nexus standard now being followed in a growing number of states, including California, is a standard of $500,000 of sales attributable to the state. Other states have different thresholds, such as New York, with a standard of $1 million of sales in the state. The consequences of not filing returns where a company is subject to tax in a state can be significant. Many states have open statutes of limitation, or extended statutes of limitation, for a state to assess a deficiency in the case of non-filers. Some consequences are more subtle, including where states haves moved from a physical presence standard to an economic nexus standard. In California, for example, a water’s-edge election is only valid (the default method being worldwide unitary) if every member of the combined reporting group that is subject to tax makes the election. FTB (the California Franchise Tax Board) recently had to issue guidance to address situations where non-U.S. members of that group that had economic nexus only in California had not participated in the election, which technically would have invalidated the election for all members of the group (FTB Notice 2016-02, September 9, 2016). What about treaty protection and permanent establishment rules? Answer: Income tax treaties generally limit a country’s ability to tax only those foreign companies that have a permanent establishment (PE) in the country. However, income tax treaties, including the U.S. model treaty, do not by their terms apply to subnational taxes such as state-imposed corporate income taxes. Thus, states are free to impose corporate income taxes on non-U.S. companies in the absence of that company having a PE in that state (or even in the United States). However, the nondiscrimination provisions of tax treaties, including the U.S. model treaty, do apply to state taxes. A recent example of where this issue came up is in Washington State, where the Department of Revenue imposed its Business and Occupation Tax on a German company— with no physical presence in the state—because that company received royalties based on Washington sales that exceeded the statutory threshold (about $250,000). The hearing officer considered, but then rejected, a challenge based on the nondiscrimination provision in the 1989 tax treaty between the United States and Germany because of a finding of no discrimination, i.e., the Washington tax on royalties applied equally to U.S. and foreign companies. (Washington Department of Revenue, Appeals Division, Determination No. 15-0251, September 11, 2015, 35 WTD 230, released May 31, 2016). Nonetheless, this treaty provision, as well as the more general Commerce Clause prohibitions against discrimination, are certainly what authorities should keep in mind involving states’ taxation of foreign companies, especially where a state asserts economic nexus. How do states compute a non-U.S. entity’s state tax base? Answer: Many non-U.S. companies are surprised that an entity based outside the United States may have a zero federal tax base, but nevertheless end up liable for state taxes. The reason lies in the significant differences between the rules for computing a non-U.S. taxpayer’s federal tax base, on the one hand, and those applicable in computing its state tax base, on the other. Generally, states use federal taxable income as the starting point for computing a taxpayer’s state taxable income, with certain modifications. If the taxpayer conducts business activities in more than one state, that income tax base is then apportioned among those states using an apportionment formula intended to measure the amount of business activities attributable to a state. If a non-U.S. taxpayer has zero federal taxable income, it is not always the case, however, that the taxpayer would also have zero state taxable income. As stated earlier, the scope of federal taxation is typically restricted by income tax treaties, i.e., to be subject to federal taxation, the non-U.S. entity must generally have a PE in the United States and income derived from U.S. trade or business. However, such treaties generally do not apply to state taxation unless a state has voluntarily elected to conform to the treaty provisions. Many states define federal taxable income by reference only to the U.S. tax rules and without regard to treaty rules. Indeed, a number of states specifically require the inclusion in the state-taxable base of income that would have otherwise been included in federal-taxable income but for treaty protection. Consequently, a state may be able to tax the company’s income even if the federal government is prohibited from imposing income tax under a tax treaty. Additionally, a number of states have recently adopted “tax haven” legislation that allows for the inclusion in the state-taxable base of foreign source income earned by non-U.S. affiliated entities in a country that a state defines as a “tax haven jurisdiction.” Under tax haven laws, a corporation is generally required to include the income and apportionment factors of affiliates formed or engaged in business in tax havens irrespective of a valid water’s-edge election. The stated purpose of these laws is to prevent alleged artificial income shifting to low-tax jurisdictions. has created a tax regime that is favorable for tax avoidance. Other states have adopted their own flavors of the criteria approach. For example, West Virginia considers a tax haven a jurisdiction that is identified by the OECD as a tax haven or that meets the MTC criteria; however, the state’s tax haven laws do not apply to taxpayers that are not using the tax haven to shift profits away from U.S. taxation. Most recently, the Oregon Department of Revenue submitted to the Oregon legislature, as it is required to do every two years, recommendations on jurisdictions to be added to, or removed from, the state’s tax haven blacklist. In drafting its recommendations, the Department of Revenue was required to utilize the criteria modeled by MTC and ultimately recommended the addition of five new states to the Oregon tax haven blacklist. The U.S. Commerce Clause restricts the states’ taxing power in interstate and foreign commerce and prohibits the enactment of state taxes that create a substantial risk of international multiple taxation. Therefore, if a state attempts to tax foreign-source income of a non-U.S. entity formed or doing business in a non-U.S. jurisdiction when the non-U.S. jurisdiction would have the right and power to tax that same income, taxpayers should consider whether the state’s tax haven legislation runs afoul of the U.S. Constitution. Are there particular cases to watch? Answer: Agilent in Colorado is interesting on the issue of when foreign companies can be excluded from a combined return. Most states with water’s-edge elections exclude from the combined return so-called “80/20” companies, generally meaning that more than eighty percent of their activity is outside the United States. But such a concept is often difficult to apply in practice. In Agilent, a holding company, World Trade, derived all of its income from investments in foreign entities (that were treated as divisions under check-the-box elections). Colorado included World Trade in Agilent’s combined corporation income tax return and argued, among other reasons, that the foreign entities had elected to have their separate legal status disregarded and because of the economic substance doctrine (i.e., the structure had no practical economic effect beyond the creation of tax benefits). The Colorado District Court rejected that inclusion because under Colorado law, only those corporations whose property and payroll factors assigned twenty percent or more to locations inside the United States may be included, and World Trade had no property or payroll of its own (Agilent Technologies, Inc. v. Dep’t of Revenue of the State of Colorado, No. 2014CV393, Colo. Dist. Ct., Jan. 20, 2016). That case is now on appeal. Compare Agilent to the Ashland case pending in Minnesota. Unlike in Agilent, here the taxpayer wanted to include in its Minnesota corporation income tax combined report the income and apportionment factors of a foreign entity (a limited liability company or SARL, using the French acronym) organized in Luxembourg. The SARL had made an election under federal tax law to be treated as a disregarded association, the effect of which was that the SARL was deemed to have distributed its assessment and liabilities to its shareholder, a domestic member of the combined report. The Minnesota Tax Court rejected the state’s argument that the election did not nullify the existence of the SARL as a separate foreign entity that was required to be excluded. The case is on appeal and was recently argued in the Minnesota Supreme Court. 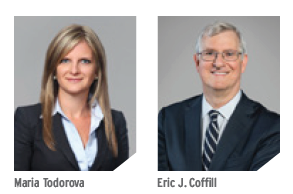 Maria Todorova is a partner and Eric J. Coffill is senior counsel at Eversheds Sutherland.